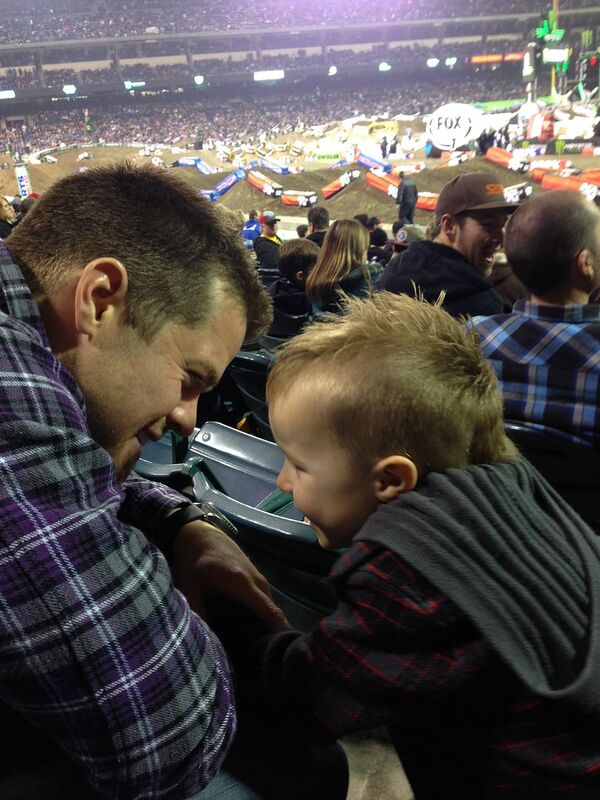 We recently took Max to Supercross for the very first time and he was in heaven! We have awesome neighbors who got us the best seats. It is basically a little boys's dream with all the bikes, lights, fireworks, music and revving of engines. He had a permanent smile on his face the whole time and I loved this sweet moment I captured of my husband and Max. How Ronin ends up every night, which is not in his crib ha. Ronin is STILL not sleeping through the night but I have decided to just embrace it (or maybe just deal with it) because I know I will blink and he will be in a big boy bed. 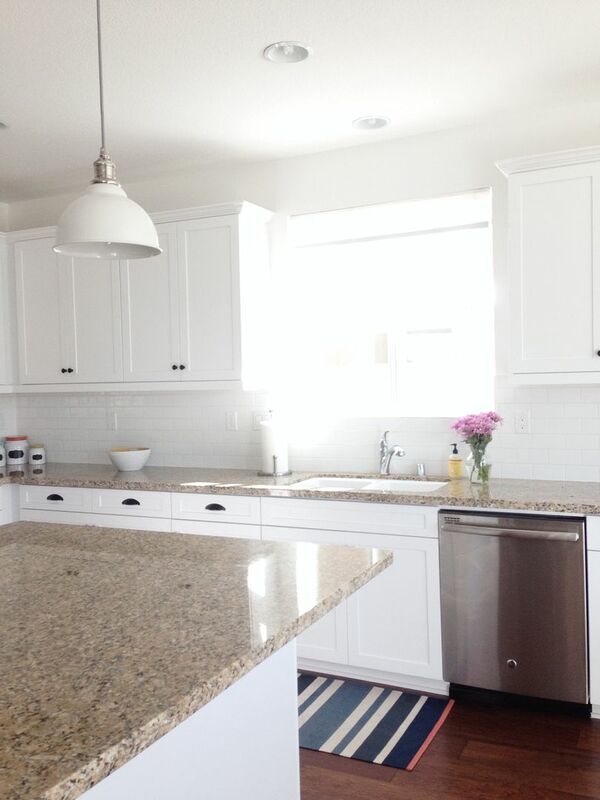 A very rare squeaky clean kitchen moment. It almost never looks like this so I felt compelled to take a picture. 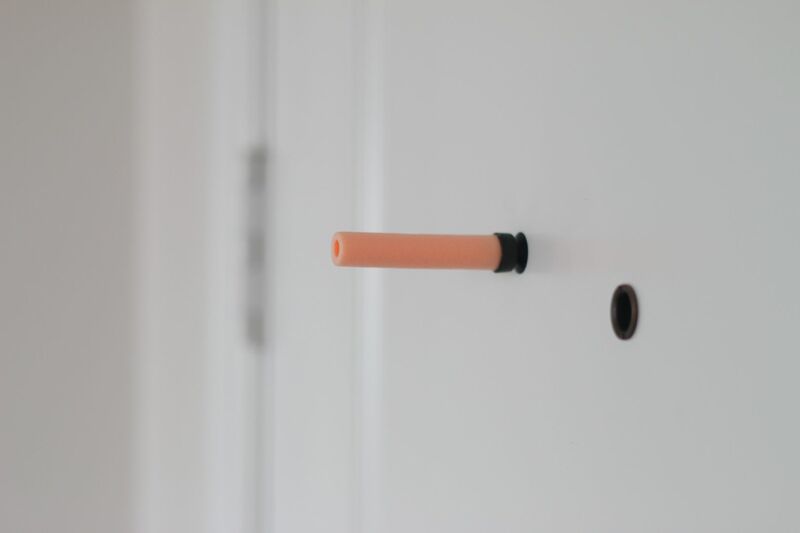 Life lately is all about Nerf guns and bullets everywhere and my front door has become Max's main shooting target. 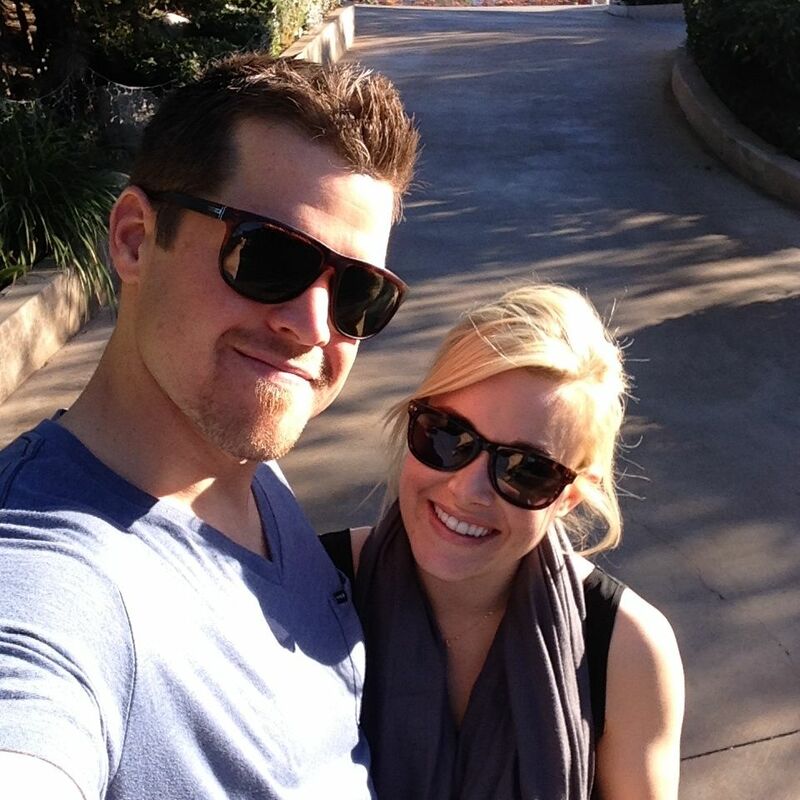 A recent weekend getaway date with my husband, thanks to Grandpa and Aubi! We drank wine, had massages, got to talk without interruptions and did not have to inhale our dinner. It was perfect. And now for the not so good...such a downer thing to say on a Friday but that's life sometimes. Pictures mean everything to me and this week I got some really crappy news. A couple weeks ago my old computer started acting all weird (first reg flag) and then a couple days after that it wouldn't even turn on. NO!! 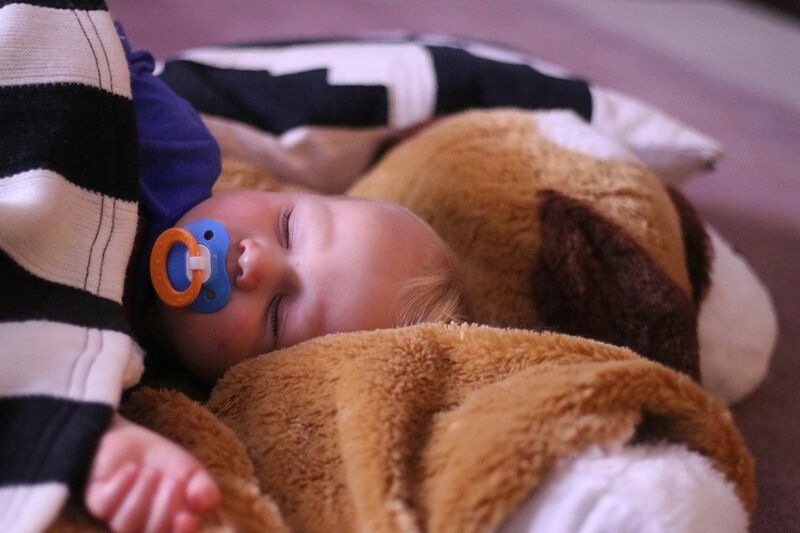 My heart sank when the thought that I might never get ALL the pictures back of the boy's lives up to this point. I am a complete idiot and had not printed out all the pictures yet from the boy's first birthday parties, Christenings, Max's first Christmas and all the other memories that you never want to forget and show your children one day. My plan was to get all settled into our new house and then print out a million pictures all at once and make giant scrapbooks. My husband works with some computer geniuses and after multiple recover attempts they said it was toast. I did not want to give up so I gave it to the Geek Squad guys at Best Buy (for a pretty penny I might add) who tried to rebuild my hard drive and get back some of the pictures. Yesterday I got the news that all my pictures were gone forever. I am so so sad about this. I decided I can't dwell and be depressed about it since it will not get any of my pictures back, but I have decided it's never too late to start capturing more moments and then immediately print them out. So just a reminder, back up your pictures and everything else important on your computer regularly! Oh no that's terrible news! Thanks for the reminder to save my pictures on my external hard drive, it's been awhile since I made a transfer. Cute picture of your son and his daddy! Oh no I'm so sad for you! My old lap top did the same thing to me a year or so ago. It wouldn't turn on half the time, and stupid me didn't think to save everything.. b/c eventually it would turn on. And then one day that was the end of it, would never turn on again. I didn't lose anything super important like you :( just tons of recipes, info, all my bill info/budgets etc. Which is a pain but not as sad as your situation. I'm sorry :( As I was reading your post, I was thinking--take it to some computer geniuses, but you did! Can't believe they couldn't save it. Was yours a lap top? I feel like those are the hardest to bring back to life and they always die! I switched to a desk top (my husband's urging) even though lap tops are super convenient. Here's to new memories! You have a great attitude! Heartwrenching news for a mother! At least you have all the pics you've posted to this blog. And, now backup, backup, backup. Smug Mug is another option. Oh I am so sorry to hear about your pictures. I think our digital generation is so bad about printing pictures, myself included. Maybe you can print them from your blog onto photo paper. Thank you for the reminder that I should back up my files. Keep up the great work on your blog; I love it! Hello Lindsay! My husband runs a computer repair business and sometimes he runs across the same problem where the hard drive is completely dead. There are companies out there that can extract the data by disassembling the hard drive in a vacuumed room (something Geeksquad or other repair companies can't do) but it costs big $$$. One big company is drivesaversdatarecovery.com. Here is an article: http://www.extremetech.com/extreme/80212-how-drivesavers-does-what-it-does. Most times it's not worth it, but I know pictures are priceless. I'm so sorry to hear that you lost all those pictures! Such sadness. I don't know why things like that happen. do you on chance still have the pictures on your memory card in your camera? i never delete the pictures off the camera because the cards hold so much memory i never need to and at some point i can just buy a new card? Every time i get a different computer i freak out that i lost all my pictures but then remember they are on the memory card. So sorry to hear that :( My husband and I pay for off site storage place that backs up our computer every night. It is $10 a month and we can access it from any computer. You may want to look into something like that. So sad for you about the pictures! We've had our hard drives wipe clean three times and lost so much! We now have a back up hard drive and I've started immediately loading pictures onto my Walgreens Photo account. Even if I'm not going to print or order right away, I feel better with them accessible on files on the internet. I must have thousands on there now. So heartbreaking! Oh my gosh Lindsay! I am so sorry! Thankfully for the blog you have documented SO much. I am going to best buy to get a external hard drive right away. Goodness. I have started backing up my pictures monthly and I'm scared of what I could lose if my computer died on the 25th of the month! I'm sorry you lost them, you are handling it quite well. My son Noah isn't sleeping through the night either and always end up in bed with us. I haven't decided if it's me embracing it or just dealing as well! But it's so true that they are only little for a short time! Ugh, that's awful. Our previous computer died on me and the same thing happened. All those moments, gone forever. THANK GOD, I had most of the kids baby pictures on discs. I now have an external hard drive, that HOPEFULLY will be a safe enough back up if dinosaur computer number two goes kaput. Plus, that's part of my reason for putting so many life/family moments on the blog. I know that feeling, though. It's horrid. Oh my gosh Lindsay! That is SO terrible...I'm so sorry...I feel pained for you. Thank goodness you have this blog with so many great pictures on it! Get Carbonite. It's the easiest way to back up all your files and you an access them from any computer or even your phone. Do it now! So sorry for you. That's just a really bad feeling. I saw on I Heart Organizing that Apple Genius Bar might help. Anything's worth a try, right. So sorry about that, it's just the worse feeling! I saw on I Heart Organizing that Apple Genius Bar might be able to help. It's worth a try. I'm going to back up this weekend, my computer started making a loud noise last month. I am SO sorry Lindsay!!! SO AWFUL!! I had this happen at one point as well and now I'm so paranoid about it. My husband is a computer genius (while I'm pretty clueless) anyway he backs all our photos up to Bitcasa. You can get infinite storage and he says it's the best. Hope this helps!! oh no!!!!! my heart sank for you!! carbonite!! a girls best friend! The minute I started reading this, I pulled out my external hard drive and plugged it in. I am so sorry about your photos. I know what a heartbreak that is. Long story short, I lost all the baby/toddler photos of my two oldest girls in a house fire many years ago. It stinks. So sorry to hear about the lost photos, it must be such a hopeless feeling. My dad is a photographer so we always have a lot of photos! My mom is always sure to print them right away and store them in our large collection of photo albums. A great tip is to backup your photos to a CD or DVD depending on the size and store in a safe place just incase, pre or post printing. There also may be some hope left to recover your photos from the memory card, you should look in to that. My dad has done it for me before when I had accidentally deleted some photos. I still have home you can recover something if not all that has been erased off your computer.